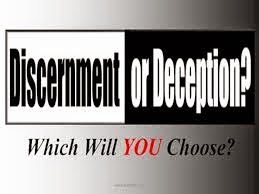 Discernment or deception—the choice is yours. Most everyone reading this will say, “Well, that’s a no-brainer,” as they assure themselves of their discernment skills. How many will slip right on past that first statement without realizing that deception is a choice? I will address this verse more fully later, but notice that the “people love to have it so.” They have no problem with the prophets and priests leading them by means of their own human skill without the Spirit of the Lord. What most American Christians have failed to realize is that it IS going to hit the fan, and they will be at the effect of that mess. Recall what Achan did during the battle of Jericho. He took some garments, silver and gold and hid it, though they had been told to spare nothing and take nothing. And all Israel got in trouble for it. So, how is it that the people of God today think that because they “don’t smoke, cuss, drink, chew or run with them that do” that they will somehow escape what is coming? The point here, however, is not about your particular individual sin or lack thereof. It is about being around those who may be destined for judgment due to their life choices. Do you really want to be in the line of fire? I think not; but without clear discernment of what is happening around you, that may well be the outcome. Lot was not aware of what was happening to him due to his choice to live in Sodom. If it had not been for Abraham standing in the gap for him, he would have been destroyed along with the rest of the city, even though he had not sinned as the others. This does not mean that he cried out to God for them. It means that he was being tortured. He was torturing himself by not removing himself from his situation. If discernment is not exercised by the people of God, they will soon become collateral damage due to the deception that is taking place within the Body of Christ among the people of God. If we are to overcome deception through our exercise of discernment, then it is necessary that we be made aware of deception and what it looks like. Paul tells us that we are “not ignorant of (Satan’s) devices.” (2 Cor. 2:11) Can I just take that as a blanket statement of truth and apply it to myself without anything from my experience to back it up? Not successfully. Therefore, it is essential that we make ourselves aware of Satan’s devices so as to not be ignorant of them. Also, the phrase “be not deceived” is used five times in the KJV, and each is coupled with a specific statement concerning some thing or event. In other words, “don’t be deceived about this,” don’t be deceived about that,” and “don’t be deceived about the other thing.” Each one is different. To be more clear, the phrase “don’t be deceived” is never used by itself as a general command or warning. So, there are specific things about which we are to pay attention. Some of those are used within a context of telling a story of deceit, but the vast majority give us warning and insight into the nature and subtlety of deception. Therefore, I conclude that knowing about deception is important from a biblical perspective. as outlined in the Bible.